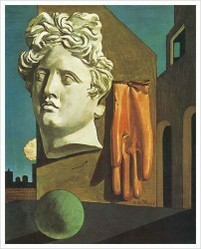 Giorgio de Chirico was an incredibly important artist in the development of the 20th century surrealist movement. The artwork of Giorgio de Chirico is instantly recognizable and has long beguiled and intrigued us with its strange, dreamlike imagery. De Chirico is perhaps best known as a forerunner to the surrealist movement, although he later rejected modern art of all styles to return to a more classical, realist style of painting. On this page you will find a collection of resources, merchandise, and information related to Giorgio de Chirico. You'll also have a chance to view some of his work and find out how to visit the Giorgio de Chirico house museum in Rome, Italy - an amazing destination for any lover of de Chirico's work. Image above: "The Song Of Love" by Giogio de Chirico. Art print available from Amazon below. 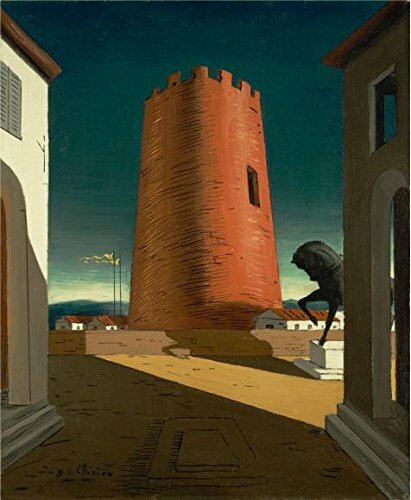 Enter de Chirico's world and experience some of his greatest works in this lovely video tribute. If you are not familiar with his paintings, this is an excellent introduction. Giorgio de Chirico was born in Volvos, Greece in 1888 to a Genovese mother and a Sicilian father. He first studied art at the Polytechnic School in Athens, but then moved to Germany in 1906 where he attended the Academy of Fine Arts in Munich. Upon moving to Italy several years later, he would paint his first "Metaphysical Town Square" painting in 1910, "The Enigma of an Autumn Afternoon." These so-called "metaphysical" paintings, which he would produce largely up through 1919, are generally considered his most notable and influential works. Their haunting, eerie landscapes of buildings, empty squares, ominous shadows and strange mannequins would be highly regarded and revered by the developing surrealist art movement. Indeed, surrealist painter Yves Tanguy would state that it was seeing a de Chirico painting in a gallery window, in 1922, which so compelled him to pick up a paintbrush and become an artist himself. However, by the autumn of 1919 de Chirico was becoming disillusioned with modern art and wanted to urge the artistic world to return to the ideas and methods of classical masters such as Raphael. His style began to change, even as he continued many of the themes and iconography from his earlier works - and these changes were not embraced by the many who had previously praised and admired his work. In 1939 he began to paint in a nearly exclusively Baroque style influenced by the work of Rubens, and resented that these works (which he considered superior to his earlier ones) were not accepted with the critical praise he had received in the past. Nevertheless, he remained a prolific painter until near his death in November 1978, at 90 years of age. Giorgio de Chirico was married twice in his life - first to the Russian Ballerina Raissa Gurievich in 1924, and then to Isabella Pakszwer Far whom he met in 1930 and spent the rest of his life with, primarily in Rome, Italy. Lovers of de Chirico's paintings must absolutely schedule a visit to the Fondazione Giorgio e Isa de Chirico House-Museum if ever in Rome, Italy. Located right near the Spanish Steps at n 31 Piazza di Spagna, Rome, this was the de Chirico home for the last 30 years of his life, in the top three stories of a 17th century Palazzo. Today the Fondazione Giorgio e Isa de Chirico graciously allows visitors to tour the home, which has been painstakingly restored to reflect its appearance and furnishings as it was during the artist and his wife's residence. Much of de Chirico's artwork decorates the walls, but of course the highlight of the tour for any artist is to visit his 2nd-floor studio. Everything is left just as if the artist might enter at any moment to resume work on the canvas left propped on his easel. The presence of de Chirico in this place is amazing, almost eerie. You can plan your visit to the house-museum between September - July, but advance reservations are absolutely required. I definitely think it's worth it - I had the chance to visit the house/museum several years ago and it is one of my top memories of Rome still today. Formed by Isabella Pakszwer Far in 1986 to preserve and promote her late husband's work. The Museum of Modern Art in New York City has one of the world's finest collections of early works by Giorgio de Chirico. Website about the artist with images of some of his most famous works. Artcyclopedia's web archive of sites dedicated to de Chirico, and where to find images of his work on-line. 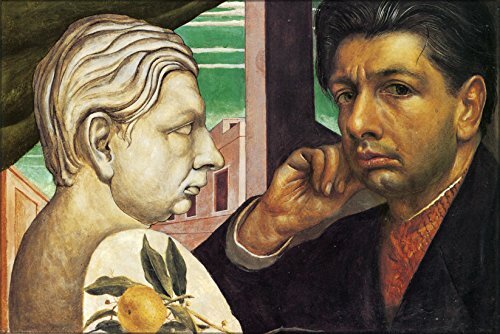 Thank you for visiting this page about Giorgio de Chirico - one of my favorite artists and someone who has influenced a great deal of my own artwork. 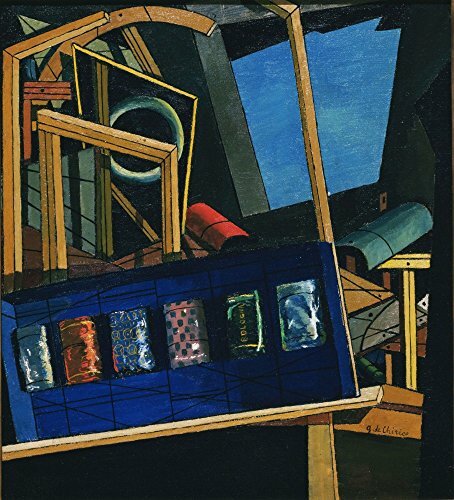 Are you a fan of his paintings, or are you just discovering de Chirico? Have you ever visited the de Chirico House-Museum in Rome? Please feel free to leave your comments here. I didn't know about this Rome museum. Rome has so much to offer that I've been daunted from visiting so far. I know, it doesn't seem to make sense, but I kept telling myself that I'll visit after I learn more . . . and more . . . about it.